Regular Triple Crisis contributor Edward B. Barbier is the John S. Bugas Professor of Economics at the University of Wyoming. 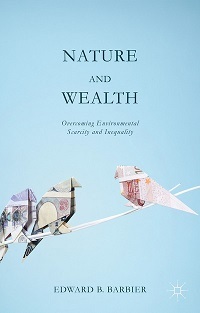 His new book Nature and Wealth: Overcoming Environmental Scarcity and Inequality has just been published by Palgrave MacMillan. Pope Francis’s encyclical Laudato Si (Praise Be to You) has created headlines worldwide for identifying environmental destruction and global inequality as the “two evils” afflicting humanity today. Drawing on historical and contemporary evidence, I argue that these two threats are symptomatic of a growing structural imbalance in all economies, which is how nature is exploited to create wealth and how it is shared among the population. The root of this imbalance is that natural capital is under-priced, and hence overly exploited, whereas human capital is insufficient to meet demand, thus encouraging wealth inequality. The figure below summarizes the key arguments of the book. Our economic wealth consists of three main assets: reproducible capital, human capital and natural capital, which also includes ecological capital. Along with financial assets, economic wealth comprises the overall wealth of countries, which is often referred to as national wealth. 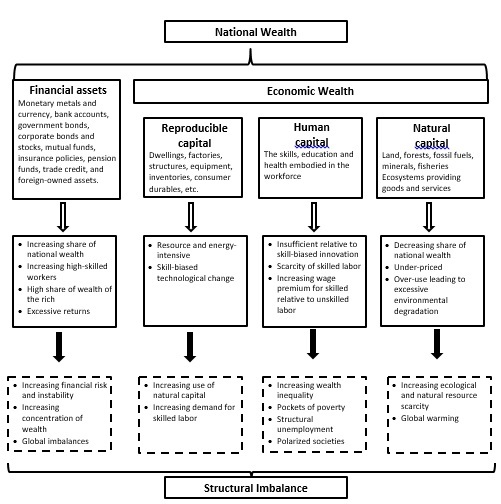 In recent decades, financial capital has become the dominant form of wealth, and more of the income and wealth of the rich is from the financial sector. Moreover, its unchecked expansion has led to greater financial risk and instability, increasing concentration of wealth and global imbalances. Reproducible capital continues to be overly resource and energy-intensive, and is the main conduit for skill-biased technological change. As a result, accumulation of reproducible capital encourages more use of natural capital and rising demand for relatively skilled labor. However, human capital accumulation in modern economies is failing to keep pace with this demand, which has caused the wage gap between highly skilled and less-skilled workers to grow. The global implications are increasing wealth inequality, pockets of poverty, structural unemployment, and increased social polarization. Finally, the under-pricing of natural capital has led to increasing over-use and excessive environmental degradation. The result is increasing ecological and natural resource scarcity, and the emergence of global environmental problems, such as climate change and concerns over freshwater availability. One reason for this imbalance is that the current structure of production in the world economy has been mainly determined by the second phase of innovations of the Industrial Revolution. These innovations occurred from 1870 to 1900, and were based largely on electricity and the internal combustion engine, which were in turn made possible by the new hydrocarbons oil and gas, along with coal. Harnessing these technological and economic changes eventually led to the rise of the United States, which became the model for 20th century industrialization. As industrialization spread worldwide, fostered by trade in energy and resources, there was a large boost to global productivity, which lasted until the 1970s. This second phase of the Industrial Revolution was also an outcome of the fossil fuel era. Since the 1890s, coal, oil and gas have accounted for at least half of global energy consumption. And, despite the rise in renewable energy and nuclear power, fossil fuels still account for 80% of energy use worldwide. In addition, as economies became more energy-intensive during the second phase, they also increased non-renewable material use, such as minerals and ores, construction materials and nonrenewable organics, which currently comprise 95% of material consumption. Two long-term trends that accompanied the second phase of industrialization have occurred since the early 20th century: skill-biased technological change and increased resource and energy use. Both trends are fundamental to understanding the structural imbalance that has arisen since the 1970s. Moreover, economies today are exacerbating this imbalance. We hide the rising costs of increasing environmental scarcity by continuing to under-price natural and ecological capital. And, rather than investing in sufficient human capital to keep pace with skill-biased technological change, we allow skilled labor to become scarce and thus attract excessive wages. It seems that we are prepared to accept the economic and social consequences of excessive environmental degradation and rising wealth inequality. To address the current structural imbalance we must tackle these twin problems of excessive environmental degradation and insufficient human capital, which I call a Balanced Wealth Strategy. This strategy also needs to include policies aimed directly at benefiting the large number of resource-dependent economies and ending the significant pockets of poverty found worldwide. In addition, global market failures – climate change, ecological scarcity and declining availability of water – need to be addressed as well. Ending the persistent under-pricing of natural capital that leads to its over-use in all economies. Ending insufficient human capital accumulation that contributes to increasing wealth inequality. Adopting policies targeted at inefficient natural resource use and poverty in developing economies. Creating markets to address key global environmental impacts. The Balanced Wealth Strategy is clearly not costless, and will require substantial commitments by all economies. But unless such a strategy is pursued, and the world economy makes the transition to a new era of innovation and growth, the current global threats of environmental scarcity and inequality will continue to worsen. In sum, this offers two possible visions of the future, one in which the second phase malaise persists and one in which the world economy enters a third phase of innovation, sustainable growth and economic prosperity. Making the transition will not be easy, but the consequences for the majority of the world’s population of the current pattern of using nature to accumulate wealth could be bleak, if not catastrophic. Pope Francis is right to call attention to the two “twin evils” afflicting humanity today.